Tomi Ungerer was not a name I was familiar with growing up. It wasn't a name I was familiar with as a teacher. I recently discovered Tomi Ungerer while writing a blog post celebrating Maurice Sendak. He described Ungerer as one of the greatest children's book creators of all time. I took Maurice at his word, looked up Tomi's birthday, and wrote it on my author birthday calendar. 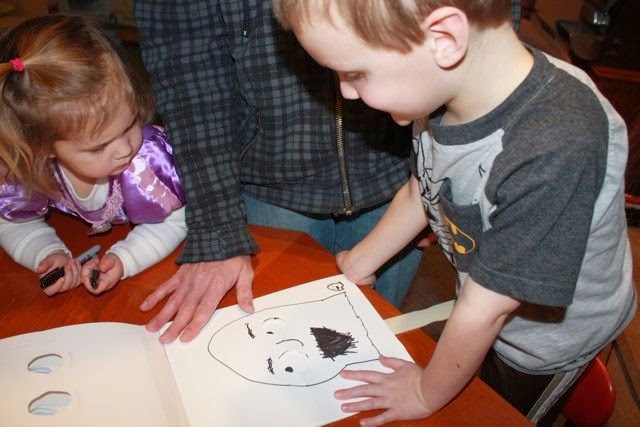 Last year I couldn't wait to celebrate his birthday with my family to discover why Sendak held him in such high regard. 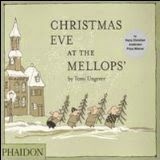 I found a small stack of his picture books at our local library, one being Christmas Eve at the Mellops'. My children loved this book. They especially loved the part when the pigs emptied their people banks to help some neighbors in need. 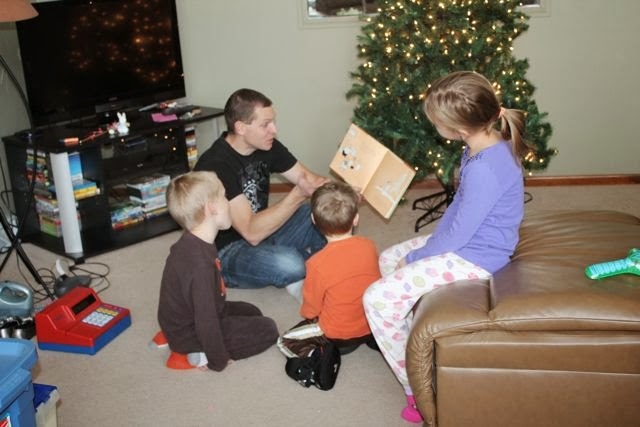 This was the perfect book to read while putting up our tree over the Thanksgiving holiday. That night I began researching Tomi Ungerer's career and I found out why I had not heard his name growing up or as a teacher. 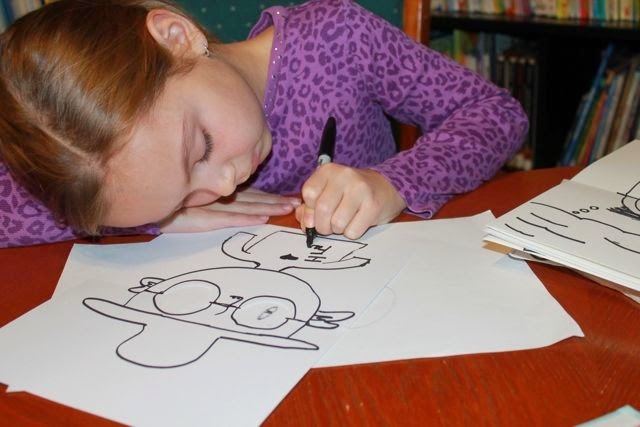 He was absent from children's books for almost 25 years. I learned his books were mostly banished in the United States because he started doing other work targeted at adults that many felt should not be created by someone also writing and illustrating children's books. As I continued to read more about Ungerer I learned that he received the Hans Christian Anderson Award in 1998 for his contributions to children's literature. I was confused to say the least. How could a children's book creator be banned for so long and then awarded one of the highest honors in the industry? I decided to postpone my birthday celebration post until I could learn and read more about Tomi Ungerer. This year, I planned well in advance and acquired a much larger stack of picture books and the documentary Far Out Isn't Far Enough: The Tomi Ungerer Story. I was eager to read the books to my children and watch the documentary. First, I watched the documentary after my children were in bed. It was very informative, enlightening, and geared completely to an adult audience. The documentary started by discussing Tomi's traumatic childhood. He lost his father at a young age and grew up in France during the invasion of Nazi Germany and the French Liberation. Tomi talked about his decision to go to America with a bunch of his drawings and manuscripts and sixty dollars in his pocket. His talent was noticed quickly by advertising agencies and Ursula Nordstrom at Harper and Row. She gave him his first children's book deal for The Mellops Go Flying (1957). His career was off and running after the success of Crictor (1958). Tomi Ungerer became more than a children's book creator. His experiences as a child in France made him sensitive and aware of social issues in the United States. He expressed his feelings through his art during the Civil Rights movement and the Vietnam War. His political posters were described by Maurice Sendak as having "immense thoughtfulness." (Far Out Isn't Far Enough.) In 1969, Ungerer explored more adult topics and self-published an adult book while continuing to make children's books. Shortly after the self-publication of the adult book he attended an American Library Association conference. 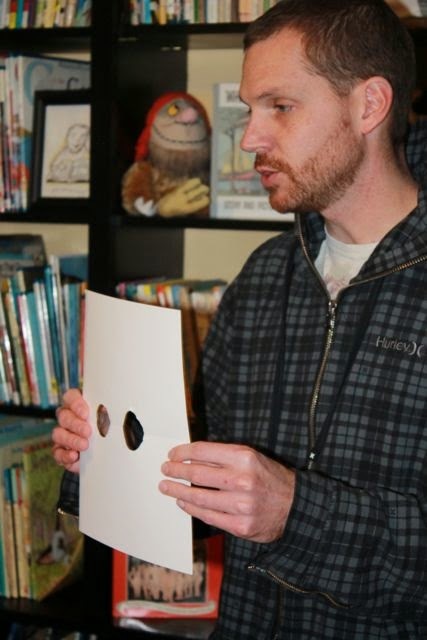 He was confronted by a librarian shaming him for making children's books while writing and creating graphic books for adults. The words Tomi used to respond to the individual caused his books to be pulled from libraries across the country. Tomi felt forced to leave the United States in 1971; first to Canada and then to Ireland in 1975. Twenty-three years later he published Flix. The children's book industry cheered his return and awarded him the Hans Christian Anderson Award for illustration. 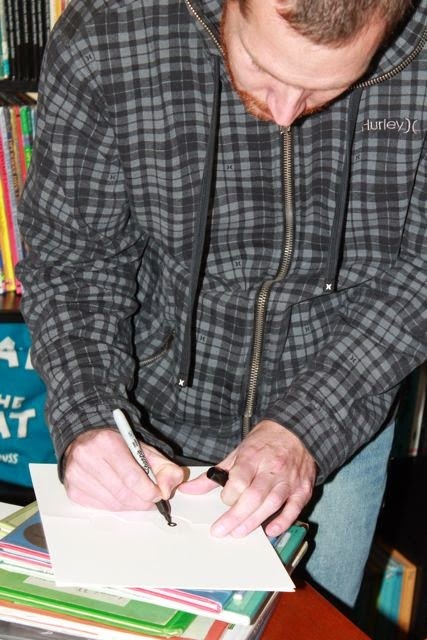 His most recent picture book is Fog Island which was published in 2013 and was named one of the best books of the year by Publisher's Weekly. The day after I watched the documentary I read The Three Robbers, Snail Where Are You?, and Adelaide to my youngest son and daughter. After we read them my son said, " Do you have any more books by that author?" These words from my four-year-old spoke volumes. My questions about Tomi Ungerer's career were answered by the documentary, but my son's words told me why Tomi Ungerer was awarded the Hans Christian Anderson Award. We went on to read three Mellops books that day and throughout the week we enjoyed the whole stack which included Moon Man, What's Good for a Four-Year-Old?, Crictor and more! Even with so many great picture books I wanted to try a birthday celebration activity based on something I saw in the documentary. It was quick, but at one point in Far Out Isn't Far Enough Tomi Ungerer burns two holes in a piece of white paper with a cigarette, lays that piece of paper down on another piece of white paper and draws a black dot in the center of the two burned holes. Then, he drew an owl around the holes. The holes and the two black dots were now eyes for the owl. He moved the owl just slightly, which repositioned the black dots, to change the expression of the owl. He said something like, "Get every expression possible with just the eyes. It is amazing with just two dots." I thought it was simply brilliant. 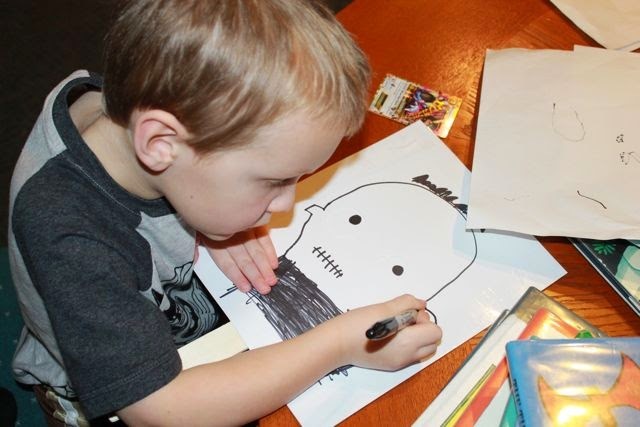 Here was my attempt to teach my children what Tomi Ungerer taught me. I cut two holes in the paper. I didn't think using a cigarette would be appropriate. I drew two black dots in the center of the circles onto another piece of paper. I had the vision of making a book of doodles that allowed my children to move the two black dots to make all the different expressions. Do you like my new library in the background? Thanks to my father-in-law I now have all our books in the same room! I drew some hair and a nose near the two circles. Then, I showed how the slightest movement of the top piece of paper, with the doodle, repositioned the eyes to make a different expression. 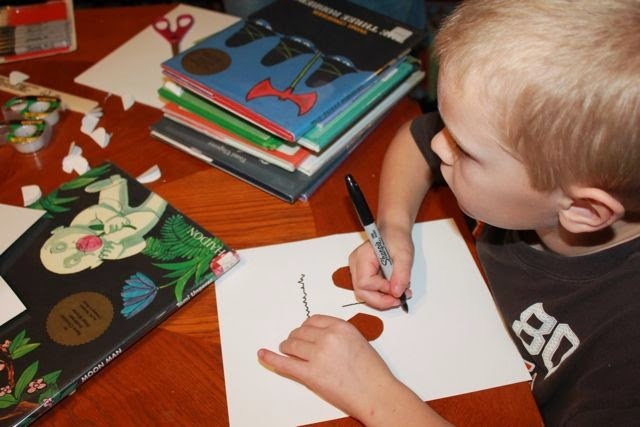 I cut circles out of pieces of paper (in the same location) for all my children and asked them to draw a person or animal around the eye holes just like Tomi Ungerer did with his owl. 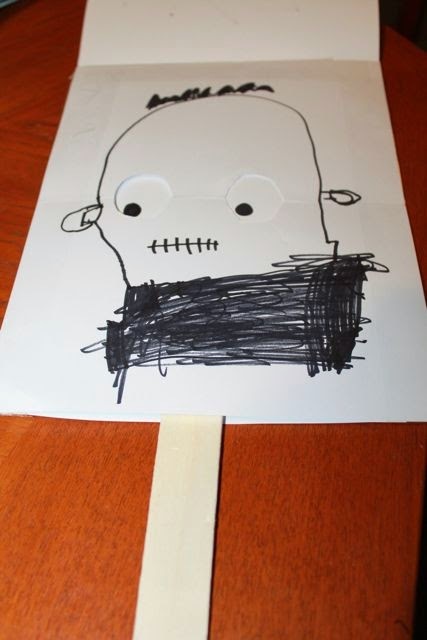 My oldest son used Moon Man as inspiration for his first drawing. My son's lip told me he was serious about his drawing. 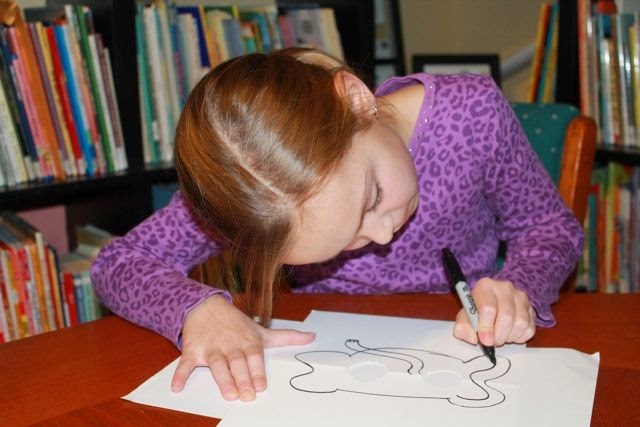 My nine-year-old daughter started by drawing an elephant. He drew ghost shapes too. I couldn't help myself. 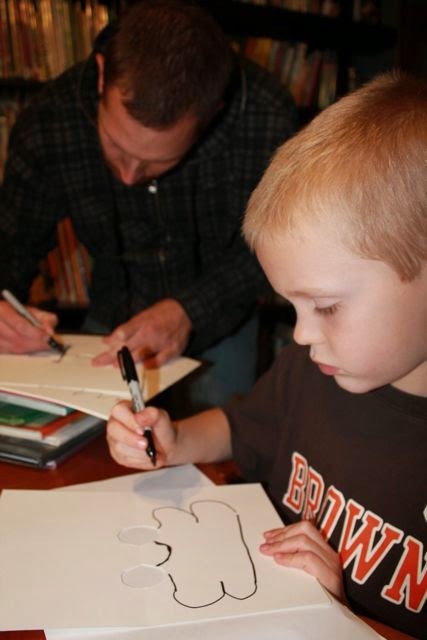 I had to draw something too as my son drew a frog. 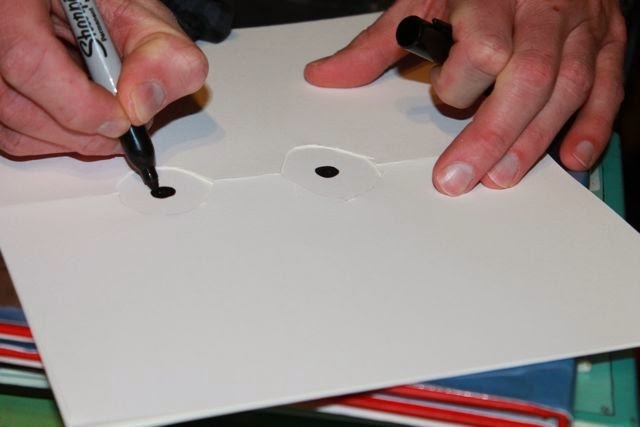 I couldn't cut the circles out of the pieces of paper fast enough. They churned out so many drawings that we had to make two books. 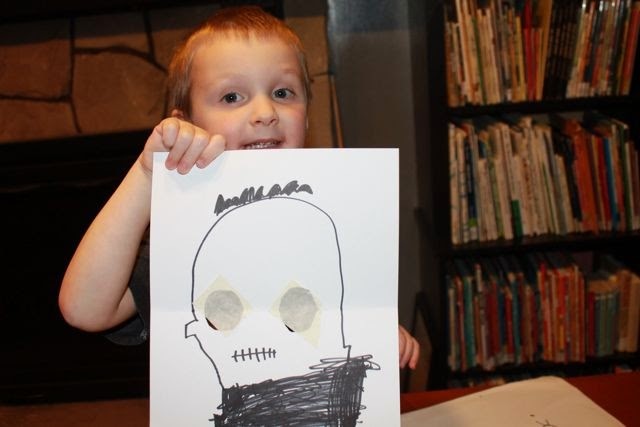 He was quite pleased with his Frankenstein! 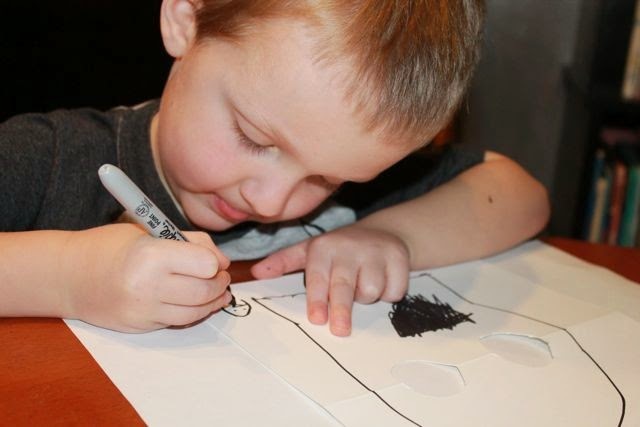 I attached the piece of paper with the two black dots onto a paint stirring stick so that it could be moved around for each drawing. 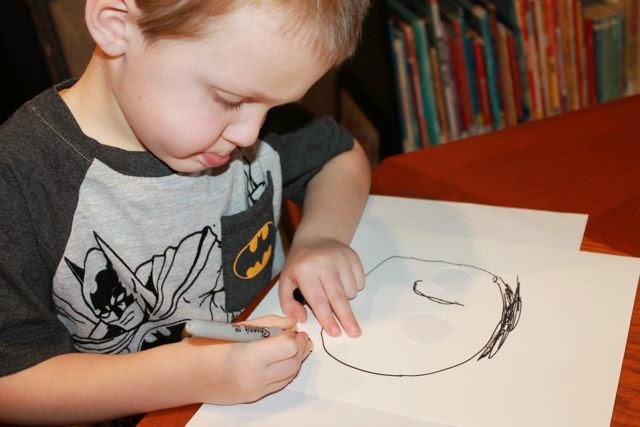 We moved the eyes behind his drawing and my son said, "It looks like he is thinking." 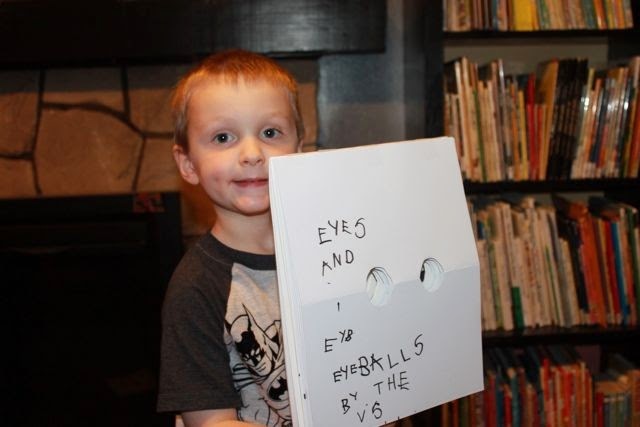 My son named our books EYES AND EYEBALLS and EYES AND EYEBALLS 2. 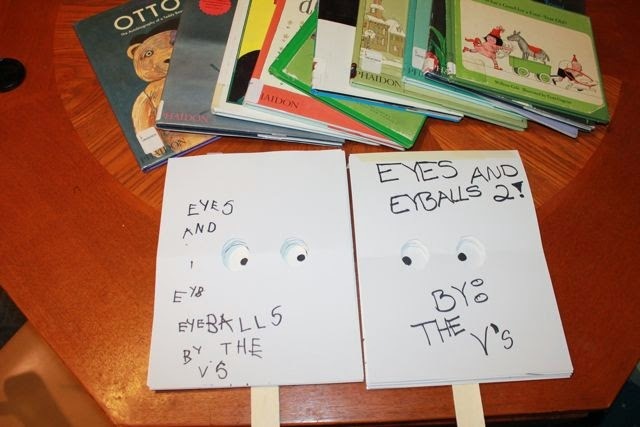 Our completed books looked at each other. We taped together all the pages with packaging and masking tape. 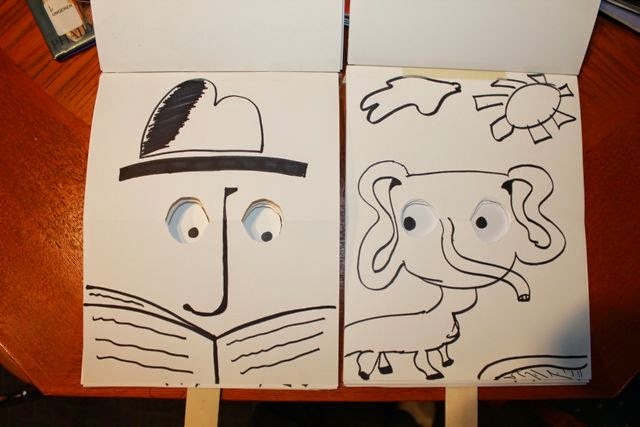 Flip the pages and move the paint sticks to find a thoughtful man and slightly concerned elephant. 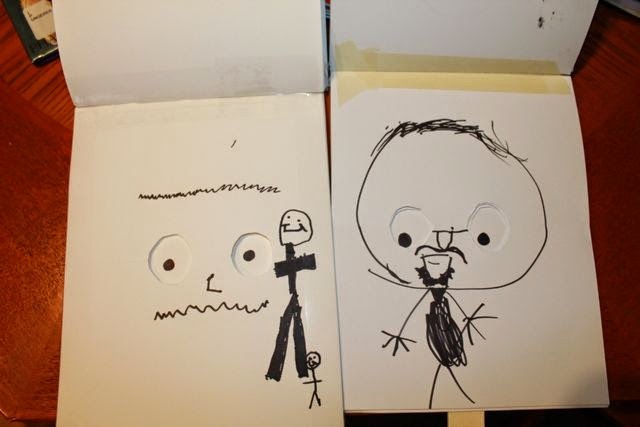 Flip the pages and move the paint sticks to find a worried boy and pensive man with a moustache and goatee. This was the last page in one of the books. 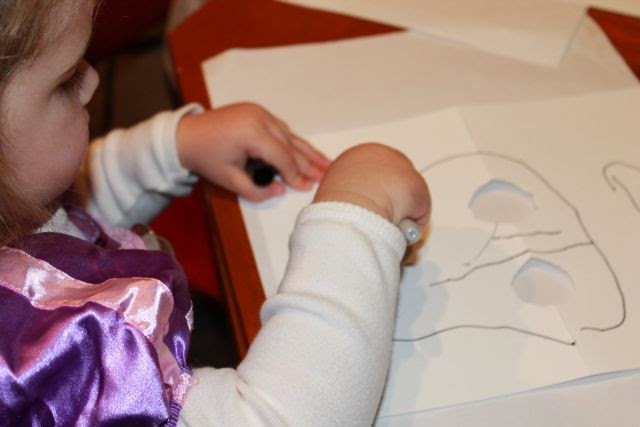 You can see that I taped the left and right side of the Frankenstein drawing to another piece of white paper. I also taped about an inch on the bottom which left an opening for our paint stick to move around. I cut about a 1/2 inch off each side of the piece of paper with the two black dots. This allowed it to move freely within the enclosure to create the different expressions. 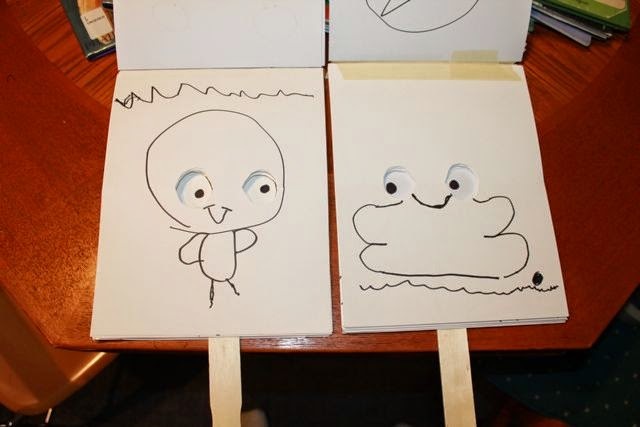 The paint stick was now part of the book and could make many expressions for each our doodles! 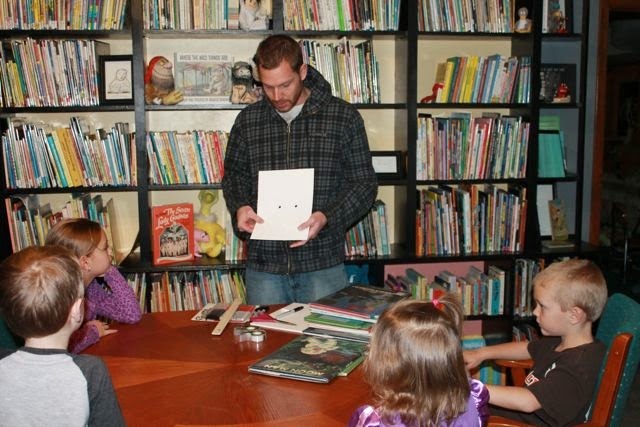 Our family reading experience of Tomi Ungerer was a year in the making and will truly be memorable. 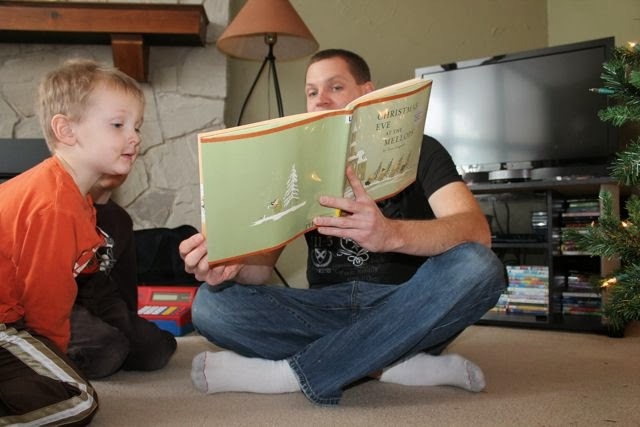 I am so happy that my children will grow up familiar with his amazing children's books. Thankfully, many of them are back in print with the publisher Phaidon. They are truly amazing and I encourage you to read them to your children. We recommended the movie MOON MAN which is based on the book. It is available for FREE viewing if you are an Amazon Prime member!